An 11 year-old boy at home alone with his 4 year-old sister shot and killed a 16 year-old intruder today when he broke into the boy’s home. The 11 year-old fired one shot that hit the older boy in the head. He died in the entryway of the home. 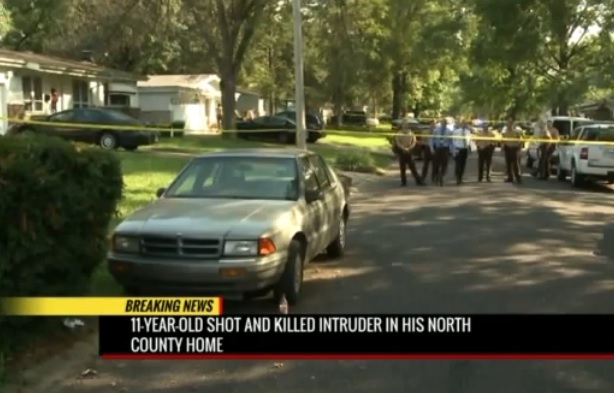 A child shot a teen that was trying to break into a home in north St. Louis County. Police say the 11-year-old shooter fired one round from a handgun and killed the 16-year-old suspect. The shooting happened in the 10200 block of Hallwood drive. Two suspects tried to break into the home twice before on Thursday. One of the suspects got into the unlocked front door of the home at around 2:30pm while the 11-year-old and a 4-year-old girl were home alone. That is when the 11-year-old shot and killed the suspect. Police found the body with a gunshot to the head in the front foyer of the home. Investigators say the second suspect ran off when shots were fired. St. Louis County police have taken the suspect into custody. They have not yet released the suspect’s id. Authorities are talking to the mother to determine why the children were home alone. They also want to know why the 11-year-old had access to a handgun. Police believe the mother purchased the handgun because of prior attempted home break-in attempts. She is cooperating with the investigation. The 16-year-old’s body was removed from the home at around 4:15pm.